Novelist, scholar, and video performance artist, Diana Slattery, bestowed samples of visionary intelligence found in her new book, Xenolinguistics: Psychedelics, Language, and the Evolution of Consciousness. Xenolinguistics documents Diana’s eleven-year adventure of psychonautic exploration. Allyson, who wrote the forward to Xenolinguistics, revealed her creative process behind a root component to her art: Secret Writing. Allyson’s 20 unpronounceable letters are symbols for the nameless presence and spirit that is immbedded in all communication; that which cannot be reduced to concepts. A Q&A with Diana, Allyson and Alex followed. 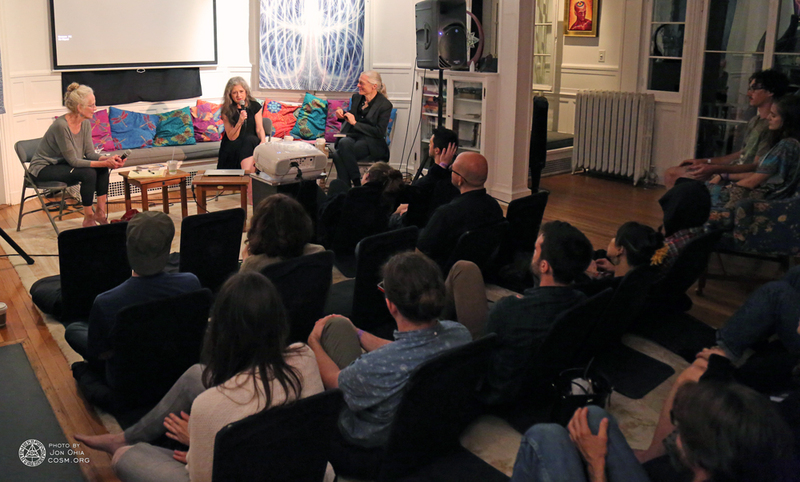 Discussions on the co-evolution of language and consciousness provided the opportunity for patrons to look deep into the realms of science, the history of language, psychedelic self-exploration, and science fiction. Thank you Diana for your knowledge and wisdom! Be sure to visit her official page to get your very own copy of Xenolinguistics! Diana Slattery presenting at CoSM.